Jessica Carilli teaches both lab and lecture courses in earth science and paleoclimatology at USD. 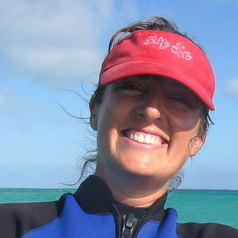 Her research interests center on how human impacts affect the coastal environment, particularly coral reefs. She has conducted coral reef research in Belize, Honduras, the Republic of Kiribati, and the US Line Islands, and is particularly interested in how runoff and fishing impacts interact with climate change stresses affecting corals.